When was the last time that you really thought about the doors on your home? The entryway to a home is an important part of its aesthetic appeal, and it is one of the first parts of the structure to make an impression when you have guests. As a further point, whether the door is the main entryway or not, it plays an important role in the security of the home and the homeowners ability to maintain a comfortable indoor environment. As the cold weather of fall and winter approach, it is important to prepare the door for the coming season. Fortunately, there are some simple steps that can be taken to keep your doors looking good and to make sure that they stay in good working condition. Leading up to fall, you want to take some steps to make sure that your home is ready for the colder temperatures that are on the way. In doing this, an inspection of the doors and windows will be one of the most important steps that you take. When you heat your home in the winter, the furnace may play an important role, but the home itself needs to be able to maintain the heat that the furnace produces. With the doors being one of the areas where heat is most likely to escape, you want to take steps to make sure that it is not allowing cold drafts to get in, and hot air to get out. As an additional point, a poorly maintained door could provide access to insects and other types of vermin. Then as the weather gets colder, these critters are going to be looking for a warm place to stay. If you make sure that the door and its framing are in good shape, you can eliminate one possible way that they might enter the home. 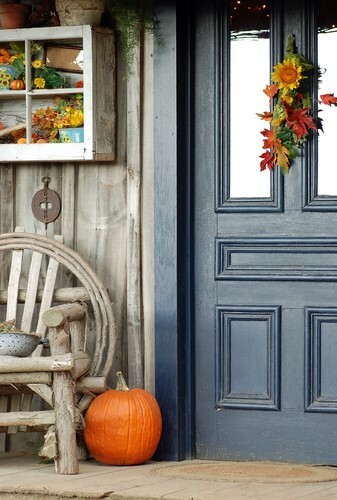 Caulking is one of the simplest and most effective ways to prepare your doors for fall. In the summer, the heat and the intense sun exposure can damage the seals around doors and windows and cause the seal to deteriorate. Inspect the seals around your doors and windows and look for any gaps that may have formed between the frame of the door and the home. If there are any gaps or damaged seals, get some caulk and touch up around the door. You can get the caulk at your local home improvement center, and it is an inexpensive way to address the situation. The weather stripping around a door or window can also deteriorate over time. The weather stripping can seal in any drafts that are occurring around a door or window and it can be a great way to ensure that the area is insulated. In some cases, it might just be that the weather stripping has come loose. In this situation, you can just put it back in place. If the weather stripping is damaged, then you will need to have it replaced. The combination of new caulk and effective weather stripping can do a lot to make sure that your home is more weatherproof. The exterior of a door can begin to deteriorate over time. If the wood is cracked or worn, then you will need to have the door repaired. A damaged exterior can allow things like moisture and cold air to enter the home. If that is the case, then the door is not doing its job. Inspect the doors for a draft. It is common that doors can develop gaps that will let in cold air, and this can be especially true around the bottom. This draft can make it harder to keep the home warm, and it will increase the expense of running the furnace. If a gap exists at the bottom of the door, you can install a door bottom to reduce the draft. This is a fairly simple solution and it is cost effective. As long as you take care of it, a good door will last a long time. After a while, it might need some repairs or it could need to be refinished, but these are steps that can extend the life of a door. However, there are some cases where an old door might need to be replaced. If none of the steps mentioned above solve the problem, then it might be time to get a new door. If you take good care of your door and prepare it for fall, it will serve you well all through the cold weather seasons. If you need a new door or if you want professional weatherizing services, contact us today. We have doors that can fit the style of any home, and we provide expert services for weatherizing, refinishing and installation.